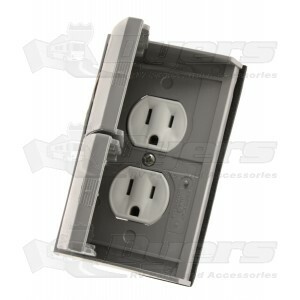 Duplex 15-amp ground receptacle with snap covers. My outside AC receptacle had failed due to water entering the box and tripping the GFCI. I needed to replace the receptacle so I searched online and found Dyer's RV Parts had what I needed at a very good price. I ordered it and it arrived as scheduled. I installed the receptacle then as a precautionary measure I also used Dicor Sealant around the outside of the receptacle to help protect it from any further water damage in the future. Once installed I turned on the power and reset my GFCI and current checked out just fine.